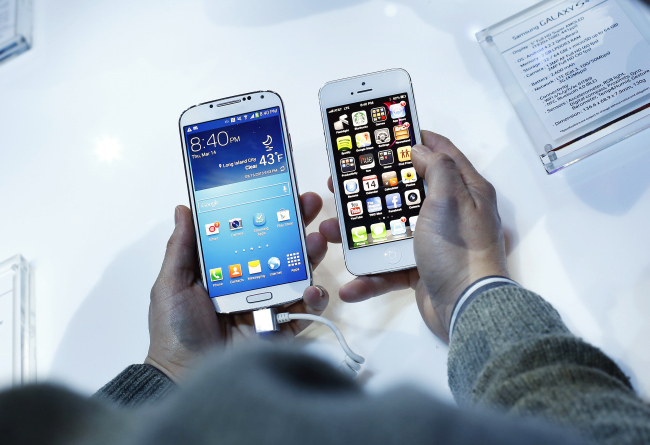 Samsung Electronics’ new flagship smartphone Galaxy S4 will be rolling out in Korea on April 25 following its launch in a number of European countries including the U.K., industry sources said Thursday. With the world’s biggest smartphone maker scheduling its media event on the same day as its roll-out, the new 5-inch Galaxy S4 equipped with octa-core mobile processors will be hitting local shelves in the next three weeks, they said. The handset released here will feature the upgraded octa-core processor running on the fourth-generation Long Term Evolution network due to specific local demand. The Korean model will be priced in the 900,000 won range. The new processor, designed for smartphones and tablet PCs, supposedly enables its users to carry out heavy-duty multitasking while being more energy efficient. Analysts say that the global IT behemoth may reach a record high 10 trillion won in operating profit in the second quarter of this year. According to recent data unveiled by The Herald Business, the estimates for yearly sales and operating profit amounted to 232.95 trillion won and 37.45 trillion won, respectively. The figures indicate that the Galaxy S4 will make a greater impact than the Galaxy S3, which also led sales and profit in the latter half of last year. Samsung officials said the firm expected to sell up to 100 million units of the new smartphone around the world, which would nearly match the sales for all its Galaxy S predecessors combined ― Galaxy S, Galaxy S2 and Galaxy S3. With high expectations pinned on the new flagship smartphone, related stocks, such as for camera lens suppliers Sekonix, Digitaloptics and Innox, are also benefiting from the hype. The new “slimmer, lighter and more solid” Galaxy S4 boasts a dual camera that enables users to record sounds while taking photos and allows simultaneous use of both cameras on the front and back to record or capture shots, according to its mobile chief Shin Jong-kyun. It has a 13-megapixel camera on the back and 2-megapixel camera on the front. The Galaxy S4 is 7.9 millimeters thick, weighs 130 grams and comes with a high-capacity 2,600-mAh battery, which is an upgrade from the previous Galaxy S3’s 2100 mAh, according to Samsung officials. It will be available in two colors ― black mist and white frost. The new smartphone also has a smart scroll and pause function that detects eye movement and puts the screen on hold when the user is looking elsewhere. It is also equipped with a Full High Definition Super AMOLED display and the stronger Gorilla Glass 3. The handset, operating on the third-generation and 4G networks, will be shipped to 155 countries to be serviced by 327 mobile operators starting later this month.